Dr. Edward Moore Penick, III was born and raised in Little Rock, Arkansas where he graduated from Central High School. He attended Davidson College in North Carolina where he received a Bachelor of Science degree in Biology. Dr. Penick received his Medical Degree from the University of Arkansas and completed his residency training in ophthalmology at the University of Missouri at Kansas City, where he served as Chief Resident. Dr. Penick is Board Certified by the American Board of Ophthalmology and is an active member of the American Society of Cataract and Refractive Surgery, the American Academy of Ophthalmology, the Arkansas Ophthalmological Society, and the Arkansas Medical Society. 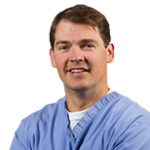 Dr. Penick is currently the Medical Director of TLC Laser Eye Centers of Little Rock, and he specializes in the medical and surgical treatment of the eye. He has performed several thousand refractive surgeries including LASIK, PRK, and cataracts and is actively involved in clinical research. Dr. Penick is married to another Little Rock native, Jill Irwin. They have three children, Edward, Worthen, and Catherine. Aside from spending quality time with his family, he is the medical director of a local charity eye clinic at Oak Forest United Methodist Church. In his spare time, Dr. Penick enjoys fly fishing, fitness training, golf, snow skiing, duck hunting, and coaching his sons’ sports teams.